1 cup dry boxed “Complete” pancake mix (you can use a regular mix, just remember to add the eggs and other ingredients). Heat oil in a skillet over medium/high heat. Combine dry ingredients in bowl. Add apple sauce and water and stir gently until blended—not too much! Then add cup of the combined mix into the pan and cook until the bottom edge is golden brown, then flip with a spatula and repeat for the other side. Garnish with honey, sliced apples, and a dusting of cinnamon! 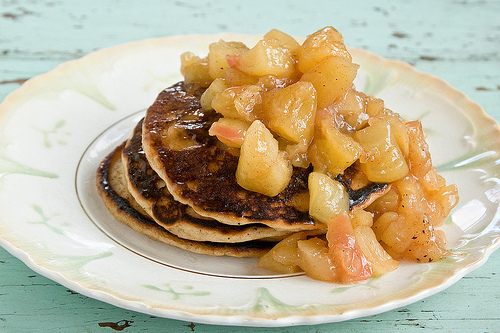 NOTES: You may want to caramelize the apples in some apple juice or butter and maple syrup to make a nice hot topping to complement the flavors in the pancakes.